NOT EVERYTHING YOU SEE YOU MUST PURCHASE. : Raf Simons Threading Stitched Trainer!!! Raf Simons Threading Stitched Trainer!!! 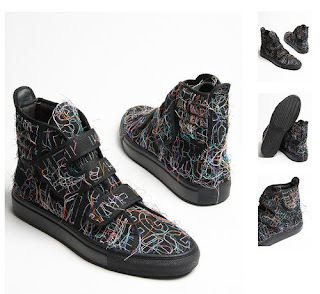 Amazing high top from Raf in a black canvas and multicoloured finish. The canvas upper is covered in multi-coloured loose threads. Sole is black vulcanised rubber and the shoe fastens with a single and double velco strap. The emboirdery on these high tops are delicate - they need to be worn with consideration.